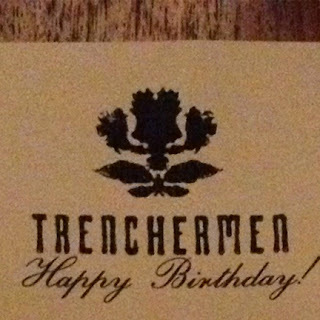 it's 100% official ... trenchermen is my new favorite restaurant in chicago. after such a fantastic brunch experience, my gal pals & i decided this was the place for an upcoming combined birthday dinner. some more about this fine establishment : "this is an eating bar as much as it is a drinking one. where it's communal at large, it's also intimate & coaxing. a sanctuary for the neighborhood. a place where conversations are shared with friends old & new ... unexpected, rooted in simplicity. a place where a good drink is best sipped, food best savored." i mean, come on. speaking of beverages, i had a couple of delicious drinks this night ... my favorite? mother's milk : carbonated vodka, citrus & pear ... my ideal cocktail & i didn't even know it until then. fabulous. pistachio, black olives + nasturtium. different from your basic beet salad, which was greatly appreciated. 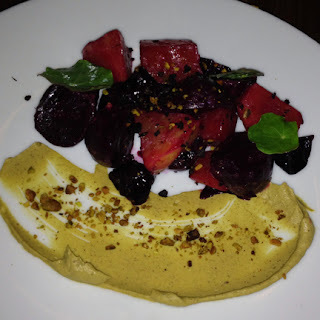 the pistachio spread was great with the roasted beets. vegetable escabeche, avocado, pumpkin seed. 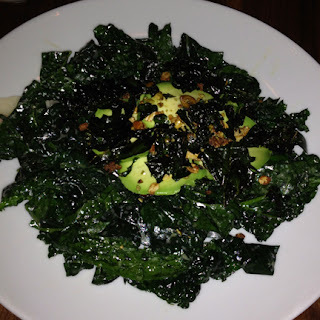 maybe the best kale salad ever. the kale was cooked, but still slightly crispy somehow. awesome. red wine vinegar + olive oil sorbet & fried bread. this.was.amazing. we could not get over how perfectly ripe the tomatoes were -- especially impressive in the middle of october. together with the fried bread & sorbet ... no words. tied with the wheatberries (below) for my favorite dishes. mapo tofu, squash, carrots, chilies & pumpkin seeds. an already-vegan-option on the menu. woot! all i can say is : delicious. 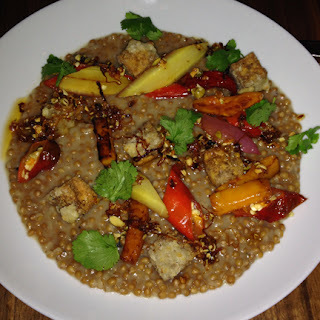 all the flavors worked together perfectly ... and i love wheatberries & tofu, so i was pretty much in heaven. we had so many heirloom items for dinner this night. 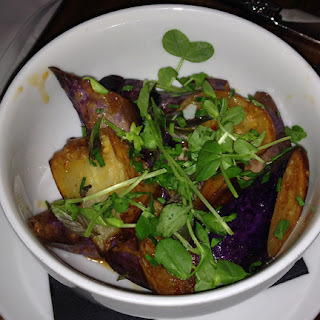 eggplant is generally a so-so veggie for me, but this side was quite tasty. pete, me, bob & noelle. alright, people. it's time to get your pretty little tushies over to trenchermen. like now. right now. 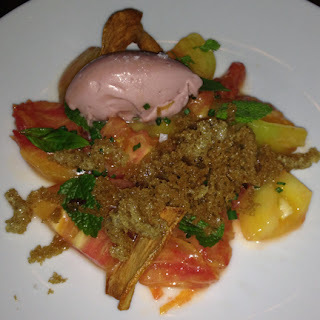 the food is awesome, the drinks are top notch & the overall environment is just lovely. i'm honestly obsessed with the decor. so seriously. whether you're looking for a nice place for a special occasion or just a casual brunch or dinner, getting to trenchermen should be your number one priority in life. make it happen. i know i'll be back very soon.